Learn about new and feature products on our news blog. The LevelMaster series of sensor are the ideal solution for conductive liquids and pastes. These sensor can ignore a large build up of conductive products like ketchup, mayonnaise, and brines. These sensors use EasyTeach technology and can be programmed for new materials in as little as 4 seconds. Simply immerse the sensor in the product you wish to detect, connect the teach wire to positive voltage until the LED flashes, and disconnect the teach wire to initialize the self-teaching function. For products that create foam, like beers, the sensor can detect the difference between the product itself and the foam on top of the product. The Level Master Sensor with hygienic design mounting adapters. In this video we demonstrate the sensor being programmed with 5 different materials. The materials include ketchup, mayonnaise, honey, beer, and beer foam. The sensor ignores massive buildup of material on the sensing area. The setup procedure is fast, easy, and accurate. Analog versions of this sensor also exist. They can be used to detect the exact level of small tanks like ink cartridges, or be used to detect the presence of a wide variety of different materials without having to readjust the sensor. The values for each material can be saved into your PLC. This is especially useful in factories that make a variety of different recipes on the same production line, such as a factory that makes different types of mayonnaise or other condiments. 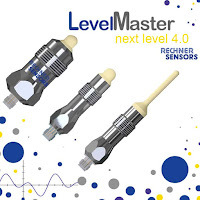 For more information on the new updated LevelMaster sensors please click this link and you will be directed to the correct page in the 26-Series catalog. Rechner Electronics and Rechner Automation will be demonstrating new sensors with new technology at trade shows in 2018. Our new stainless steel analog level probe (with no moving parts! 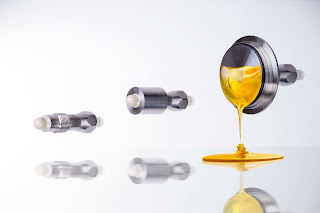 ), our 26-series sensors with AtEx and hygienic design, our capacitive sensors for highly conductive and viscous products (like ketchup and mayonnaise), and our Bluetooth connected sensor will be on display. See for yourself with our Bluetooth sensor just how easy level sensing can be. With this sensor you can track material buildup on the sensor, view your ON and OFF switching points, your hysteresis, and have piece of mind that the sensor will work every time. Click here to subscribe by e-mail and get updates whenever a new post is added. Level Control Made Easy is our motto. With that in mind, Rechner Sensors has designed the worlds first capacitive sensor with BlueTooth for industrial automation. With the provided android app you can remotely monitor your sensor to ensure it is adjusted correctly and that it is functioning properly from a remote location. Easily check the status of your sensor. The provided android app let's you monitor the ON and OFF switching points, the hysteresis, and the material buildup on the sensor in real time.